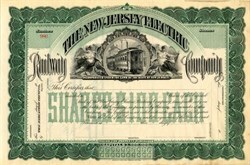 Beautifully engraved RARE certificate from the New Jersey Electric Company printed in 1894. This historic document was printed by American Bank Note Company and has an ornate border around it with a vignette of an electric train flanked by angels. This item and Secretary and is over 112 years old. New Jersey Electric Ry.� Length of track, 40.57 miles. Gauge, 4 ft. 8 in. Rail (T), 70 and (girder), 90 lbs. Cars owned, 105; snow-ploughs, baggage and postal cars, 11; power station, 1 of 1,500 h. p.; engines to generate power, 8, one to each generator. Chartered Sept. 14, 1894, for 50 years; municipal agreement is perpetual; authorized to use electricity, cable and horses, and required to pave between and 18 in. outside of tracks; as consideration for franchise, p. c. of net receipts are given on 4 m. of track. Organized Sept. 20, 1894; road opened�part in April, 1893, Jan. and June, 1894, June, 1895, and in Aug., 1896. Leases the Paterson. Passaic and Rutherford Electric Ry. Co., and the Jersey City, Hoboken and Rutherford Electric Ry. Co.; the former company was a consolidation of the Paterson and Little Falls Electric Ry, Co., Grand Street Electric Ry. Co., Paterson and Passaic Electric Ry. Co., People's Park Electric Ry. Co., and the Passaic, Rutherford and Carlstadt Electric Ry. Co.�see subjoined statements. On Dec. 14, 1897, the President was appointed receiver. Operations, year ending Dec. 31, 1897.�Earnings (passenger, $246,548; freight, $269; other, $1,768), $248,585. Expenditures (superintendence and management, $163,799; repairs, $41,735), $205,535. Financial Statement, Dec. 31, 1897.�Capital stock (shares, $100; auth. by charter, $3,500,000; by vote of company, $2,600,000), paid in, $2,287,000; funded debt 1st mtge. 5% 50�yr. $1,000 gold coup. bonds, dated Nov. 1, 1894, interest May and Nov., at office of the trustee, auth., $3,500,000; issued, $2,600,000), $2,367,233; other debts, $756,917�total, $5,412,050. Contra: Cost of road, equipment, etc., $5,395,331. Interest on bonds due in Nov., 1895, was paid one-half scrip and one�half cash; the scrip is redeemable in two years in cash or bonds. Interest is now in default. Trustee of bonds: Mercantile Trust Co., 120 Broadway, New York. The remainder ($900,000) of the authorized issue can be issued for extra equipment, extensions, or improvements and for the purchase of contiguous or connecting lines free from bonded debt.